Getting married is a pretty big deal to most people and like most big deals, you want to get great pictures to remember them by. Seeing as you only want to get married once, there’s a lot of pressure on getting those moments captured exactly right, with everyone (especially the bride and groom) looking good in that wedding album! Unfortunately, despite the large number of photographers there seem to be, somehow the process of finding the right one for your wedding can be quite stressful. However, there are a few simple things you can do to help make sure that you choose right! Understand the style of photography you are looking for, before you begin your hunt. Choosing the style you’re after should be among the top things on your wedding planning to-do list. Knowing the kind of pictures you want taken at your wedding will help you narrow down your search to a smaller pool of photographers, making the process much simpler. If you’re uncertain about what style you’re going for – do a ton of research and shortlist some photographs you like. Keep these in mind while looking through portfolios to help you pick out a style suited to yours. Now, when you’re flipping through photo albums and you have a set style in mind, make sure you pay attention to the execution too. A style is just the idea behind the photograph, but what truly makes a photograph is a lot more. Pay attention to the angle, composition, framing, and the creativity. Take note of the attention to detail and how well they capture the important and key moments. Most (if not all) photographers will either have a website or a social media account. Look through the reviews left behind by customers and their experiences with them. Additionally, if you haven’t already - ask your friends and relatives about good photographers they can vouch for. Different photographers give different rates for their services, and offer various packages. Once you’ve narrowed down a few photographers according to the style you’re after and your budget, compare their rates and the packages they offer. For example, photographer A gives you a lower price for the service but photographer B gives you a higher price for a service that includes wedding photo albums and prints. Compare the value of each offer and choose the one that suits you best. Before hiring a photographer, make sure you have an accurate understanding of how long the post-production is likely to take. This depends entirely on how comfortable you are with waiting. The average photographer is likely to make you wait a month or so until you get the final pictures. Be very clear on what your needs are and what you would expect in case of delays. We hope these tips can help you choose your wedding photographers! You can read this article for other tips to choose wedding photographers. 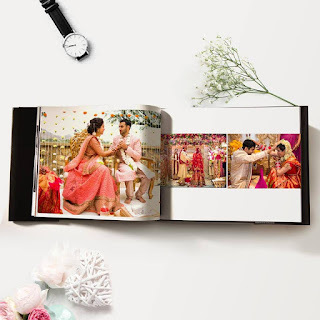 If you want to create wedding albums or print the best photos from your wedding day for wall decor, have a look through photojaanic.com where you’ll find a bunch of options at very affordable rates.